Very exciting news. 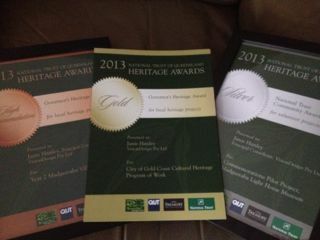 We were awarded three more Queensland National Trust Awards for 2013. A High Commendation Govenror’s Award was received for the Year Two Mudgeeraba Discovery Walk, A Silver Community Award for the Commemorations Project for th eLight Horse Museum, and a Gold Governors Award for the work done for Gold COast City Council on the Heritage Program of work. Great news for us – and excellent for the Gold Coast – not generally renowned for its heritage.